Eve Schaub and I have a lot in common. We are both 40-something writers who have adopted Vermont as our physical and spiritual home. Seduced by the New England small town and rural aesthetic, we know our way around a farmers' market and can wax rhapsodic on the virtues of local, seasonal, and organic everything. We were both lapsed vegetarians, albeit for me only briefly, a transformation in attitude occasioned by the availability in areas like ours of locally and humanely raised meat. For vacation we'd both go back to Tuscany before we'd go anywhere else. Finally, and most relevant here, we both became aghast at the insane amounts of sugar in American food and attempted to wrest some control of the volume of sugar in our diets from multinational corporations and well-meaning bake sale vendors. For Ms Schaub, her sugar epiphany was catalysed by a video on the evils of sugar. Whilst far from being ignorant about healthy eating, she experienced a dawning horror at the amount of sugar her family, particularly her two daughters, was mindlessly consuming despite her avoidance of fast food and obviously empty calories such as soda. Avoiding sugar entirely seemed impossible but, not being one to shy away from a challenge, that is exactly what she set out to do, for an entire year, with her family joining her. Predictably, there were tears from her children, but her husband, leery of radical diets from having grown up with a father who experimented with bizarre dietary extremes, was surprisingly game. 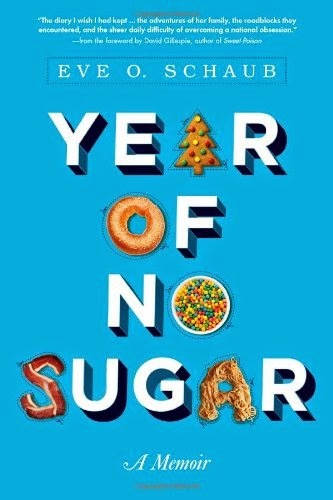 Her book chronicles the setting and enforcing of the no-sugar rules for the year, which budgeted for monthly treats, a "birthday party rule" that allowed the girls to make their own choices about what to eat when they were away from home and their peers were eating sugar, and a personal exception for each family member – the one form of sugar they could not live without for a year. The difficulties of shopping, dining out, eating at someone else's house, negotiating holidays like Halloween and Xmas, are all described with unvarnished candour. They made mistakes, especially in the first few months, not realising, for example, that balsamic vinegar contained sugar. I think my favourite mistake was when they bought their daughters some strawberries and plain yoghurt for an afternoon snack in Florence only to discover the yoghurt was actually whipped cream. I bet the girls were in heaven. Some recipes adapted to be made with dextrose (an allowed form of sugar in her experiment) were a success but others failed to gel, literally. As an appendix, Ms Schaub lists recipes that are sugar-free as well as recipes for their monthly sugary treat. The latter I found a bit odd as recipes with copious amounts of sugar are, to put it mildy, not difficult to find and somewhat at odds with the tenor of the book. But I understand that readers might be curious about them, considering how evocatively she describes their monthly sugar mirage, and how carefully they selected their most beloved family recipes as treats. Another thing Ms Schaub does not sugarcoat (sorry—I was going to have to use it at some point, so best we get it out of the way) is her children's reactions. But it is clear that neither girl will have cause to look back on it as the Year from Hell. The number of exceptions, the sweet but sugar-free treats made from dextrose and fruit, and their opportunity to eat sugar at school if they so chose, hardly made it a literal year without sugar. The scary thing, as Ms Schaub notes, is how much less this still notable amount of sugar was compared to a typical year, let alone a typical American child's diet. Remember, these were kids who had a mom that bakes bread and who had never set foot in a fast food restaurant, so their sugar consumption was already far below the norm. The most striking point, which the author emphasises repeatedly, is that the girls adjusted in many respects more easily than the adults because they had less time on earth to become addicted to sugar. At five, the youngest was the quickest of the entire family to adapt, and by the end of the year the palates of the entire family had changed to such an extent that they willingly chose to eat less sugar even when it was allowed. In addition to the gradual alteration of their palates, another point the book makes is how the process of avoiding sugar in 21st century America exacts a mental toll due to the vigilance necessary to police the sugar content in every morsel that drops into our shopping carts or passes our lips. As consumers in America, we have more nutritional privilege, more choice, than people virtually anywhere else on the planet, but that illusion of choice evaporates when faced with an entire aisle of cereals or sauces all of which contain some form of sugar. Skipping dessert, as Ms Schaub explains trenchantly, does not cut it. Go to a cookout steeling yourself to resist the s'mores and find that the buns, dogs, condiments, side dishes, even the chips, all contain hidden sugar – and the only drinks without real sugar contain poisonous artificial sweetener, which is worse. Any event of significance, from major holidays to ostensibly healthy occasions like a 10K fundraising run, is accompanied by vast amounts of sugar. Avoiding it requires superhuman will power or complete social isolation. During her family's year of no sugar, they employed both of those tactics, along with the aforementioned judicious exceptions to make holidays and birthdays bearable. I have taken a far more moderate approach to the sugar problem–there was never any possibility of me having the will power to give up sugar entirely, let alone when on holiday in Florence, surrounded by gelato–but I experience this same frustration and horror at sugar, sugar everywhere. When I picked up the book, I knew exactly how the author was going to react when she started looking for the hidden sugar in everything because I have been there, and continue to rage impotently against the purveyors of sugar. I, too, peruse labels and cook and bake from scratch. That is simply a necessity. I wish I did not have to. It would be nice to stop for an ice cream with friends or enjoy a cookie in a coffeehouse that did not contain ten times the amount of sugar necessary. Also, as Ms Schaub notes, making everything is time-consuming. I prefer baked goods and ice cream with much less sugar than in purchased varieties but it is not practical to always bake or make my own ice cream. But the more prepared foods you eat, the more sugar you ingest, and any food, whether it contains sugar or not, is more satisfying when it is homemade. The ultimate lesson of her book is not just about avoiding sugar for health reasons but about appreciating food. Mindless eating is invariably less healthy than cooking local, seasonal, organic, fresh ingredients from scratch. Kids, she notes at the end of her missive, are inherently aware of this. They will take homemade bread over store-bought cake. Children know, she concludes, what is special. That sense is something we have lost in the world of corporate food where sugar is used as a drug to stimulate unhealthy consumption and addiction. It is less will power than an appreciation for real food that may save us.